With this lock, you don’t have to worry about losing your keys ever again because it unlocks using your smartphone. In life, there’s nothing more frustrating than locking your keys in your home. In today’s digital world, wouldn’t it make sense to have doors which don’t require keys? Smarke is a smart lock designed to meet the needs of property managers and hosts on sites such as Airbnb and HomeAway. With the device, users can lock and unlock doors using their smartphone. Additionally, hosts are able to control access to property whether they’re near or far. The companion mobile app enables users to manage access to all their properties with Smarke locks on them. Through the application, it’s possible to share access with friends, family, and guests while customizing the length of access depending on the duration of their visit. Once access is shared, it’s possible to keep track of who accesses the home and when, plus users can also receive alerts when the visitor arrives. To simplify the access scheduling process, Smarke features a built-in calendar interface as opposed to users having to enter dates manually without any aids. Smarke is designed to fit on any Euro Profile Cylinder Lock and takes minutes to install. These types of locks are standard on all new properties built in the UK; however, the company is currently working on other versions of the device. As far as size goes, Smarke is 116mm x 68mm x 53mm, and it runs off four AA batteries. In order to make installation as simple as possible, Smarke is battery operated so there’s nothing to wire or connect. The battery is rated to last for six months, and when the battery is running low, an alert is sent via the mobile app. For security, the device uses military grade encryption to ensure only authorized users can control the lock. In addition to the lock, Smarke also has a companion intercom chip. For apartments with call boxes and locked exterior doors, this enables users to enter the building without using a key. Should the company raise $200,000, they’ll also develop a keypad to enable building/room entry when other options fail. According to the creators, Smarke came about when the founder lost the keys to a rental apartment they were staying at in London. After being locked out, the founder’s frustrations only got worse because he was asked to pay the costs to replace the locks on the host’s door. So far the makers of Smarke have raised over $80,000 via crowdfunding with an estimated shipping date of September 2017. Early bird pricing for the device starts at $124 for the smart lock alone. The package containing an intercom and smart lock sells for $294. 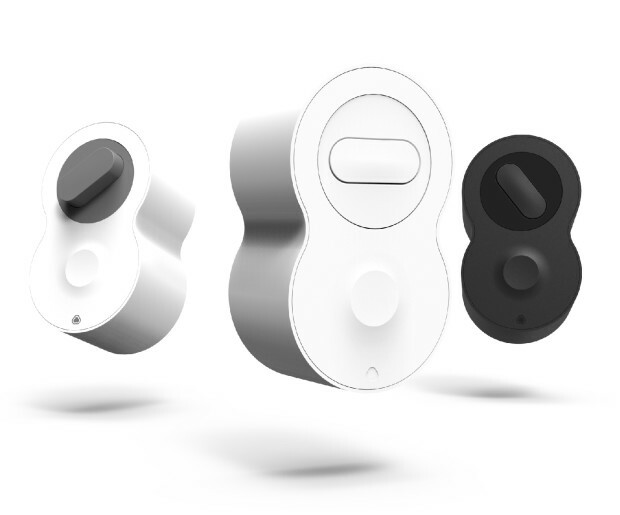 The device comes in white, gray, and black colors. I like the idea of the intercom being integrated in the package. That is a great upsell for something like this! Seems easy enough and probably should have been something that was invented with the first smartphone. It all makes sense to me and seems pretty easy to setup and install. My question is hat happens if you lose your phone?